Miami city commissioners have given preliminary approval to the build-out of Brickell Key, a man-made triangular island at the foot of Southeast Eighth Street. The plan from property owner-developer Swire Properties would bring a new residential tower to the southern corner of the heavily residential island, adding about 668 units. Also called Claughton Island, the 44-acre island is connected to the mainland by a bridge. The island is home to high-rises offering office space, hotel rooms and luxury condos. On Oct. 8, commissioners unanimously approved on first reading an amendment to the Brickell Key Development of Regional Impact or DRI order, reducing the permitted non-residential floor area and increasing residential units. “We’ve not maximized the density on this island,” Lucia Dougherty, an attorney representing Swire, told commissioners. In addition to the new residences, the developer plans a 3.5-acre linear park encircling the island, she said. It would be “a great amenity, for us and the public,” Ms. Dougherty said. The city’s Planning, Zoning and Appeals Board and the planning and zoning department recommend the project for approval. The Brickell Key DRI Development Order was adopted Feb. 12, 1975. State policies mandated regional planning agencies to prepare impact reports for development of regional impacts in adherence with the Environmental Land and Water Management Act of 1972. This summer, Swire received a letter from the Florida Department of Economic Opportunity stating the proposed development would need local government approval for an amendment to the development order. The proposed amendment would reduce the permitted commercial floor area by 676,116 square feet and add 668 residential units, and would allow a 3.5-acre linear park. The analysis touched on how the development on the island impacts the city. Swire presented a traffic study showing evening peak hour outbound traffic is fewer than 600 vehicular trips. The development order refers to the park area as a 3.5-acre park on the island’s west shore. 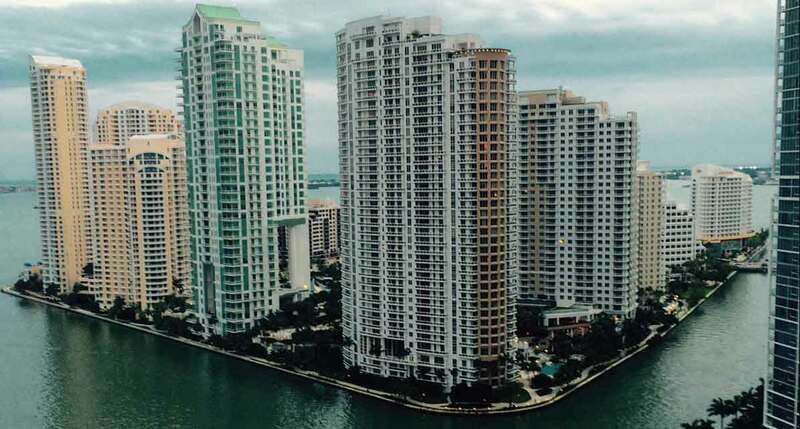 “The applicant’s submitted survey for this amendment illustrates the 3.5-acre park to encompass the west, north, and east baywalk areas of Brickell Key, thereby maintaining the intended 3.5-acre area requirement,” the analysis says. The staff report mentions an amendment to the development order to provide 225 units of moderate-income affordable housing on the mainland in locations other than Overtown/Park West. Swire Properties paid $3.2 million in an escrow agreement in 1986 to satisfy the affordable housing requirement. The Oct. 8 motion of the commission approving the first reading added a bit of land to what will be considered open park space. Commissioner Marc Sarnoff made the motion, requiring 3.75-acres of park. A final reading may be scheduled for this month or November. Just west of the island across Brickell Avenue, Swire Properties is building the $1.05 billion, 5.4-million-square-foot, mixed-use Brickell City Centre. No matter how you parse it, an additional 668 units will definitely impact traffic. But if MetroMover were extended east and north to Brickell Key, residents would have the option to leave their cars behind when venturing into Miami’s downtown gridlock. Plus, they could get off at Swire’s Brickell City Center to shop, dine, and catch a flick. Anything that takes cars off the road is a good idea and a MetroMover station on Brickell Key will only enhance the worth of the property on the island. Perhaps a PP3 between Swire, Miami and the county could make this work.